You are here: Home / Recipes / Dessert / Pineapple Ice Cream! I love this Bowl! It’s huge and it has a storage lid, but the best part is you can use it to drain fruit to use juices in your recipes! 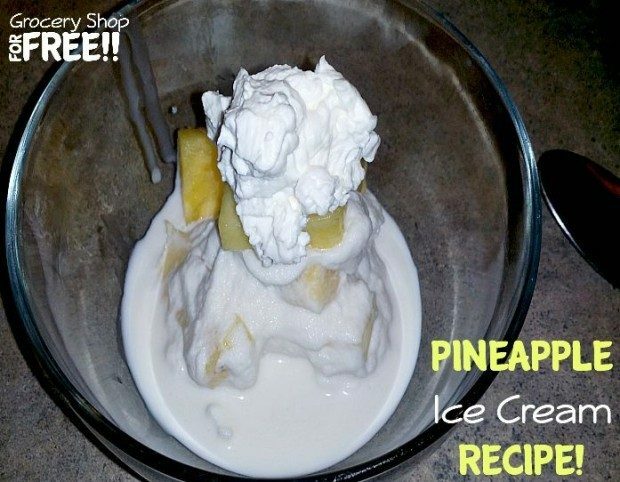 Hubby used it the other night to make Pineapple Ice Cream – with no added sugar! Always a plus! There were some nice pineapples on sale this week at the store and he grabbed one to try this ice cream! Combine Milk, Dextrose, and salt stir with wire whisk until dissolved. Stir in Half and Half, Whipping Cream, and Vanilla. Add to ice cream machine with Pineapple slices. Leave machine on for 20 – 40 minutes or until desired consistency is reached. Whip ingredients together with whisk in mixer until desired consistency is reached. I like cookies and cream or chocolate chip ice cream especially in the summer. I just love the fresh fruit in the summer. I could eat watermelon everyday, all day. But can’t beat icecream, or some tasty popsicles on a hot day. Leave a comment here telling us your favorite summer treat. I love fresh fruit sorbets! I want to try making a watermelon sorbet…. My favorite summer treat is Ice Cream. I love watermelon in the summer! I could eat it everyday! Strawberry shortcake is my summer time fav. I can’t get enough fresh watermelon in the summer – so good! My favorite summer treats are fresh fruit or chocolate chip mint ice cream!